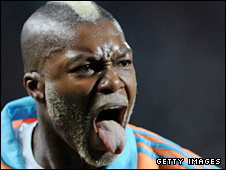 France coach Raymond Domenech has left Marseille striker Djibril Cisse and AC Milan midfielder Mathieu Flamini out of his final 23-man squad for Euro 2008. St Etienne striker Bafetimbi Gomis, 22, was preferred to Cisse after scoring twice on his debut in France's friendly win over Ecuador on Tuesday. Former Liverpool striker Cisse missed an easy header during the 2-0 victory. Flamini, who left Arsenal to join Milan at the start of May, was also left out as Domenech trimmed his initial party. Goalkeeper Mickael Landreau (PSG), defenders Julien Escude (Seville) and Philippe Mexes (Roma), and midfielders Alou Diarra (Bordeaux) and Hatem Ben Arfa (Lyon) were the other five players dropped. Gomis, who turned down the chance to play for Senegal to represent France, grabbed Domenech's attention by scoring 16 goals in 34 appearances for St Etienne this season. He was the star of the show during the game at the Alpes Stadium in Grenoble, while Cisse - who missed the 2006 World Cup with a broken leg - was booed by France fans. Has Domenech made a serious error in leaving Trezeguet out? Juventus striker David Trezeguet had already been left out. Trezeguet, 31, scored 20 league goals for Juventus in Serie A this season and is France's third all-time scorer with 34 goals in 71 games. "It's an organisational choice," said Domenech. "There are four or five central strikers, you can't cram each position. You have to make choices." Trezeguet scored the winning goal for France in the Euro 2000 final against Italy and played his part in the World Cup-winning side of 1998. More recently, the Juventus striker started in France's 1-0 friendly win over England in Paris in March but was taken off for Sidney Govou on 64 minutes after a poor display. Though Trezeguet is reported to have a difficult relationship with Domenech, the France coach insisted it was not an easy decision to make. "It's never easy to wake up having to cross names from a list," he said. Six Premier League players are named but Arsenal's Gael Clichy misses out. Chelsea stars Claude Makelele, Florent Malouda and Nicolas Anelka are included the squad along with Manchester United full-back Patrice Evra, Arsenal's captain William Gallas and Portsmouth midfielder Lassana Diarra. France begin their Group C campaign against Romania on 9 June in Zurich, followed by matches against the Netherlands on 13 June in Berne and Italy on 17 June in Zurich.